The Kverneland Exacta HL with volumes up to 3.900 litres and with a maximum spreading width of 54 metres is the perfect spreader for more capacity. 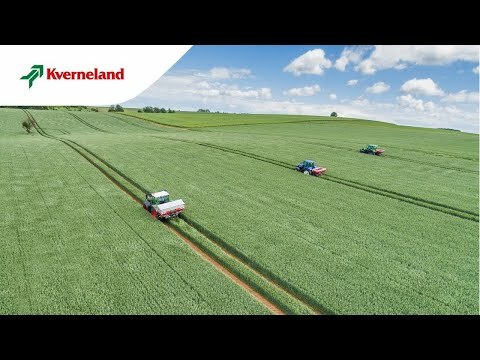 With dual PTO input shafts on the centre gearbox, it is easier to always drive at the desired speed and in combination with the ‘slow rotating’ agitator system, the Kverneland Exacta HL spreader can spread with high disc speeds to get a very even spreading pattern. The Kverneland Exacta HL spreader can be operated hydraulically or electrically. The electric controlled spreader can be operated from the tractor cab via the Exacta Remote II computer. The compact EasySet 'dashboard' gives you considerably simplified accurate setting and adjustment of application rates. Two hydraulically operated metering plates, each with three discharge openings ensure an equal fertiliser flow from the hopper to the spreading discs. The Exacta HL/TL(X) spreaders are also available mounted on a trailer frame. Central Hydraulic Drive as option available for the HL/TL(GEOSPREAD). Delta shaped heavy duty grids are standard equipment of the Exacta HL/TL(X) spreader. Centre gear box with 2 input shafts for high and low disc speed settings is standard equipment of the HL/TL(X) spreader. Hopper emptying kit is optional available to easy get the last fertiliser out of your hopper. Long lifetime LED lighting set, is optional for the EL, CL and CL-EW. For the HL, TL and TL(X) GEOSPREAD spreader is this standard equipment. The mud guards (option) protect the spreading disc against mud, water etc.